A sump and sump pump system is used to remove excessive water situated around the foundation of a home. It does this by intercepting the groundwater collected by the weeping tile and/or drainage material around the foundation, and pumping it elsewhere. The sump pump is typically activated by a float, triggered by a rising water level in the sump. No drainage at all In the early days of home construction, basements were not considered living space, but simply a means to get the foundation of the home below the frost line. In this scenario, there was no real attempt made at facilitating drainage, and it was accepted that the basement would be wet and maybe flood from time to time. Gravity drainage At times, if the home was constructed in what was considered are relatively elevated area, or dry area, a foundation would be built with drainage materials (gravel) around the foundation floor and walls. This facilitates any water that does reach the foundation walls/floor to have a preferential flow path vertically downward to promote infiltration down below the foundation. This is not very common. To the surface, if there was very steep ground such that this was possible. To the sanitary lateral trench, where the water could infiltrate or be stored within the granular backfill of the lateral trench. To the sanitary/combined sewer lateral, where water would flow quickly away to the sanitary or combined sewer system. To the storm lateral, where the water would flow quickly away to the storm sewer. Note that this type of system would normally be equipped with a backwater sanitary valve due to the inherent flood frequency of storm sewers (designed to flood every 2 to 5 years, or so). To a sump pit. 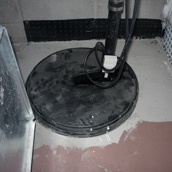 If required, the sump pit could be equipped with sump pump(s) to direct the water as needed away from the foundation. Sump pumps have traditionally been connected to the sanitary sewer lateral, storm sewer lateral or, as per current best practice, to the lawn away from the home. Others There are likely other unique styles of foundation drainage currently in place due to specific location conditions. A sump and sump pump system is therefore a foundation drainage system that allows for automated draining of a home’s weeping tile by pump. If you are in a relatively dry area, you may have a home that has been built with a sump pit, but has never required a sump pump since it appears to always be dry. This is great! However, you need to keep in mind that the weeping tile likely does drain to this sump, and in the event a large rainfall did occur, the sump may begin to fill. If you are in a relatively wet area, you likely already have one or more sump pumps that are active when either it is raining heavily, in the spring when the groundwater level is high, or in some situations, at all times. There do exist homes around the City with multiple sump pumps working continuously 24/7. In these scenarios, there may be benefit in working with City Engineering to investigate other potential long-term drainage options. 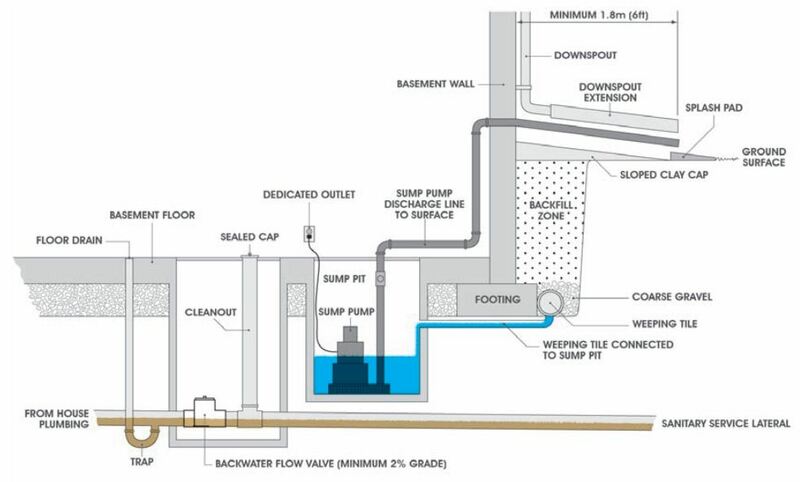 The schematic below shows a typical sump and sump pump system. The sump pump should discharge to either the storm sewer (if a dedicated storm lateral is available) or better, to the lawn, at least 2 metres away from the home, for infiltration. Sump pump discharge lines need to be equipped with a check valve which prevents the water contained in the pipe above the sump pump from flowing back into the sump when the pump shuts off. The length of the discharge pipe should be minimized where possible, to reduce the strain on the pump. While not shown in this photo, the idea of having multiple pumps is a good one. This redundancy is especially important if you have a finished basement, or store valuable items in your basement. Typically, most available sump pumps are electrical devices. However, it is not unheard of during a storm to have a power failure at the same time. Just when you need your sump pump, the electricity goes out! If you consider the contents of your basement to be valuable, then consider a second pump with an alternative backup power source. First and foremost, the sump needs to intercept the weeping tile. More often than not, if your home’s foundation was originally connected to the sanitary sewer, you will need to sever that connection and redirect the weeping tile by installing a new piece of pipe from the weeping tile, into your basement, beneath the foundation. Ideally, the sump should be located as close as possible to the best surface discharge point possible, and that would be an area that is well graded away from the home, with a large area for infiltration, and not impacting neighbours. Ideally, the sump should also be located in the lowest spot in your basement. Having a sump in the low point of your basement means that should a flood occur, the system can best assist you in draining your basement in an emergency without water pooling elsewhere. If you have a finished basement, everything is a little bit more complicated. The best spot according to the rules above may not be the best spot based on how you have finished the basement. Speak to a contractor about how to find the most ideal location as a compromise between basement usability and sump system effectiveness, and design accordingly. Sump systems, similar to backwater sanitary valves, are not maintenance free. In order to best protect your home from flood damage, follow the pump manufacturer’s recommendations for servicing and maintenance of your pumps and be diligent about getting it done. 3.7 Damage to sanitary sewer system – offence: No person shall break, damage, destroy, deface or tamper with, or cause or permit the breaking, damaging, destroying, defacing or tampering with any part of the sewage works. 3.8 Discharge to the Sewers: No person shall discharge sewage into the City’s sewage works except in accordance with this By-law. 3.9 Unauthorized discharge sanitary sewer – offence: No person shall discharge or permit to be discharged anything other than sewage into a sanitary sewer. 3.10 Unauthorized discharge combined sewer – offence: No person shall discharge or permit to be discharged anything other than sewage into a combined sewer. 3.11 Connections Prohibited – offence: No person shall permit the connection of a roof leader or foundation drain to a sanitary sewer or combined Sewer. The complete by-law is available as a PDF document from the City of Kingston website. Having a sump system discharging to the lawn is considered to be best practice for foundation drainage for two reasons. First, they don’t pump storm and groundwater to the sanitary sewer, and secondly, they offer a physical disconnect from the storm sewer system as well as opposed to a storm lateral. They are a good practice in isolating your home from backwatered storm and sanitary sewers, and let you size appropriately for the groundwater conditions around your home. One thing to note: Sump pumps, by building code, need to be powered on their own dedicated electrical circuit. It is recommended that the necessary electrical connection be made by a qualified and licensed electrician. Q: What if the surrounding ground is already wet a lot of the time or I have sump pumps that are already running 24/7? A: If you have perpetually-wet conditions, or frequent surface water pooling, you may wish to consider investigating more significant drainage options for your lot, perhaps even together with your neighbours. Some options may include surface regrading of lots, or installation of some form of drainage system, such as a “French drain” or ditch/swale. These options are dependent on having some kind of a drainage outlet, i.e. a natural drainage channel, or a storm sewer, and most often than not, that is the biggest challenge. Q: If I run the sump pump discharge to my lawn, won’t it increase the chance of water getting into the basement? A: Yes, it might. This impact can be minimized by running the discharge pipe as far away from your home as possible (2 metres away from the foundation is considered the minimum) or dispersing the water over a larger area using a flexible perforated pipe or something that can be moved around a bit. There are also options like building a shallow ditch or swale, or re-grading to move the water away from your home. Q: What if I don’t have any green space and/or my only option is to discharge my sump pumps to a public sidewalk? A: This is not considered an acceptable solution as your private lot drainage will create a freeze hazard in the winter and serve as a liability to you. This is a private storm drainage issue which will need to be reviewed with the City’s Engineering Department to help you find a more suitable place for your drainage to go. Q: Can I discharge my sump pump out into the street? A: Yes you can, but never across a sidewalk as this would present a safety risk to pedestrians. We suggest that you discharge your sump pump 10 to 15 feet from your side of the property line. The flow will have a chance to filter into the ground before reaching the road. Q: How can I check my sump pump lines for freezing? A: A good place to start is the discharge point outside. Is it buried under snow? You’ll need to dig it out. Then you can pour water into your sump hole and manually trigger operation of your sump pump system (i.e., flip the switch). Check your discharge point to ensure the water drains. If not, you may have a problem with frozen water lines and will need to take measures to thaw it.